Provide a sheltered oasis for guests at your outdoor event with this party canopy from Eureka. Safety is the top priority for any event, and this canopy comes complete with storm lines and a fire-resistant top. 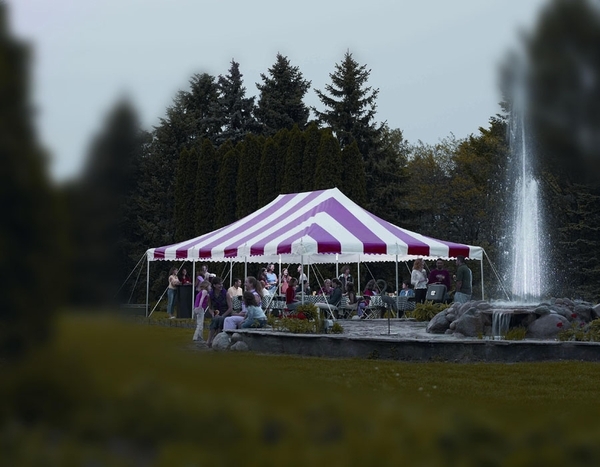 This 20-by-30 foot pole tent covers approximately 600 square feet of area to keep your food, decorations, and guests dry in the event of a rain storm. With anodized sectional aluminum poles and reinforced corners and pole positions, this canopy is made to stand up to weather and multiple uses. The white or colored striped top is also resistant to mildew in case of damp storage conditions. Two people can set up this pole tent with ease, and all of the guy ropes, "D" fittings, poles, stakes, and storage bags are included with the canopy. Rely on this party canopy to provide shade and shelter for your special events this year.